The complex structure of AAV-2 can be described by three layers of organization. The basic subunit is the capsid protein VP3 which is comprised of 533 amino acids. In addition the VP1 and VP2 proteins are present in a 1:1:10 ratio to VP3. In our representation, the N-terminus of VP3 is shown as gray spheres in order to facilitate visual detection of the higher organization structures. The two loop insertion sites 453 and 587 are highlighted in magenta and blue, respectively. To reach the icosahedral capsid symmetry five VP3 subunits were aligned by their N-terminus in a star-like fashion. 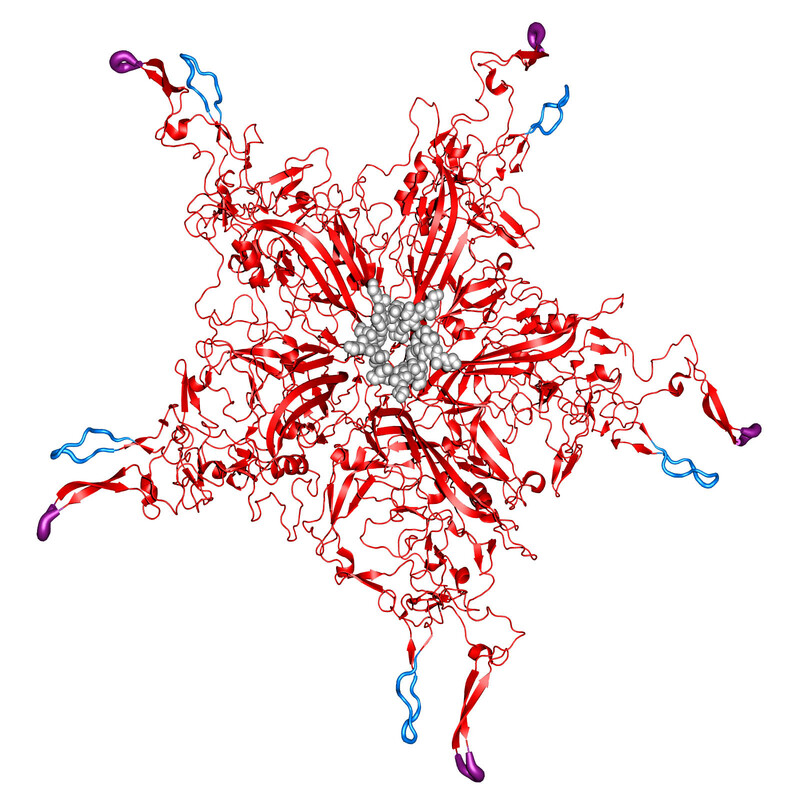 As seen in the 3D-structure image, the termini form a pore which act as the entry point for the single-stranded viral DNA, in case of the virus contruction kit the vector plasmid. The highest level of organization, the completely assembled viral particle, comprises 60 capsid protein subunits and an icosahedral symmetry. The capsid assembly follows the scheme shown on the left. After transcription of plasmids coding for capsid proteins they assemble in groups of five. Subsequently 15 of those pentamers are arranged in an icosahedral symmetry and form the complex virus capsid where each pentamer corresponds to one corner with a pore complex in the center. Structure modeling was used to simulate and visualize the capsid assembly based on X-ray crystallography data. Xie et al. analyzed cryo-frozen virus crystals by Laue diffraction to solve the three dimensional structure of AAV-2. (Xie et al. 2002; Xie et al. 2003). to visualize the N-terminus and the loop-insertion sites. To highlight the loops, the B-factor visualization mode was chosen and the coloring was set to match the scheme of the virus construction kit. Each assembly step was rendered individually finally put together to animations consisting of up to 100 images depending on the perspective. In addition to the static images we managed to raytrace image sequences and create animations. In the first animation the capsid assembly is represented. To provide another perspective of the viral capsid composition thin slices of the particle were used to create a stack. 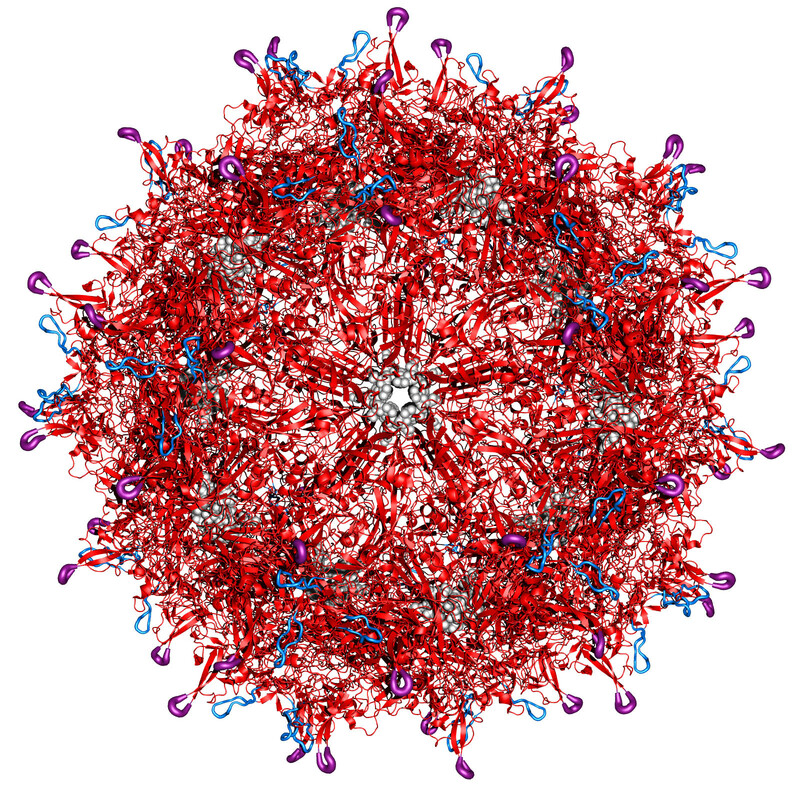 Click on the image above to see the high resolution animation of capsid assembly! To see the two slice animations click on the image above!